After months of wanting to go, we finally made a trip up to The Yorkshire Sculpture Park to see the KAWS exhibition in my 2 week break. We were lucky to get a break in the weather, and enjoy most of it in the sunshine. We had never been to the Yorkshire Sculpture Park before, and I made the rookie error of arriving in a pretty pristine, pair of high top vans. I suddenly felt rather foolish, when I saw person after person kitted out in wellies or walking boots! Eek! We then also saw a sign that warned to wear appropriate footwear, but to be fair they are trainers, so worst case scenario, I’d have to throw them in the washing machine when I got home. In the end it actually wasn’t that bad when it came to mud. Though I was surprised at how spread out the place was. What a wonderful space they have to work with, and oh so beautiful! We had taken Winston along with us, so he had a great walk up and down the hillsides, as we made our way to the indoor part of the exhibition. The bold, striking pieces contrast wonderfully with the Yorkshire countryside visible through the gallery windows. 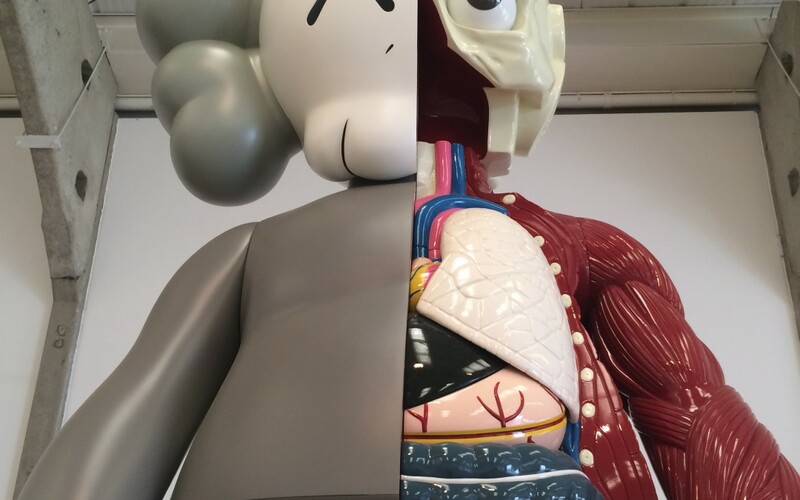 I originally saw some of KAWS work last Summer as part of Artzuid in Amsterdam, so seeing his work again gave me happy memories to trekking for miles around the city trying to find sculptures. The outdoor sculptures are a sight to be-hold partly due to their sheer size! They are both fun, and disconcerting, having a friendly, cartoon quality, but also a sense of despair to them. After our walk round we kicked the mud off our shoes, and made our way to a lovely dog friendly pub 10 minutes drive away. We were rewarded with a fantastic meal including the best pub chips I’ve ever eaten. It was a good day!